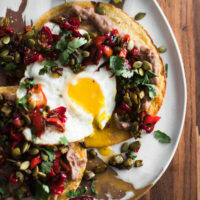 Pinto Bean Tostadas with Nopales and Eggs | Naturally.Pinto Bean Tostadas with Nopales and Eggs | Naturally. There are quite a few steps in this recipe and it feels like it would be easy to dirty about five pans. However, if you do everything in steps, you could easily use one to two pans and still have this meal be ready in 30. Heat a medium cast-iron skillet to medium heat. Add the 1 tablespoon or so of oil followed by one tortilla. Fry on both sides until crisp and browning then repeat with remaining tortillas. Add more oil to the pan as needed to fry. Set tortillas aside and return the pan to heat, removing all but about one tablespoon of oil. Add the diced peppers and nopales. Cook until the nopales have released their juice and both the nopales and peppers are beginning to brown. Increase the heat to medium-high towards the end of cooking to get a nice browning if desired. Turn off the heat and stir in the lime juice, salt, cilantro, and pepitas. While the nopales are cooking, prepare the eggs in a non-stick skillet of your choosing. Fry or scramble the eggs and set aside. After the eggs are done, return the pan to the heat and add 2 teaspoons oil and the minced garlic, cooking for a minute or so. Add in the cumin, salt, and beans. Bring the mixture to bubbling, reduce the heat slightly then cook until the beans are hot and most of the liquid is gone. Turn off the heat and mash the beans with the back of a fork. Assemble the tostadas with a spread of the mashed beans, the egg, a heavy sprinkle of the nopales mixture, and extra cilantro/lime juice as desired.